Sleep Training Success Stories — Blissful Baby Sleep Coaching | Sleep is Bliss. As a pediatric sleep expert, I’ve helped over 800 families solve sleep dilemmas and establish healthier habits. You’re tired, and you’re wondering how to get there yourself. Read on for rave reviews from parents who have worked with me. You may see your story in theirs. It's time to make a commitment to improve the situation for your whole family. I can help. This incredible Cultural Strategist and Advocacy Leader has important work to do in the world. After trying EVERYTHING on her own, her darling 15 month old daughter was STILL not sleeping through the night which was really taking a toll on her professional performance & business travel expectations and the situation was challenging to the whole family unit. After Janelle & her extended family collaborated with Blissful Baby Sleep Coaching and moved through a gentle and fully customized sleep plan and support, we reached all the family sleep goals and everyone is living happily-ever-after! Turning a "HOT MESS” into BLISSFUL SLEEP! This Pediatric Chiropractor reached out for export support when he had exhausted all his professional expertise to help his daughter sleep. These parents did not expect that their 5th child would pose the ultimate sleep challenge. Their 6.5 month old daughter required “around the clock” nursing, holding, bouncing and rocking. Each parent was getting no more than 2–3 hrs of sleep in 24 hrs and their lives were endless “tag teaming” as they managed a household of 5 children plus a family Pediatric Chiropractic business. Life was BUSY and life was HARD. Luckily they reached out for help and now their daughter is sleeping 12 hrs a night and takes 3 naps a day…all HAPPILY in her crib. She is an entirely different baby…thriving and blissful! -Child was 6 months old at time of guilt-free, gentle sleep coaching. I would 1000% recommend working with Joanna of Blissful Baby Sleep Coaching. Working with someone who is so experienced and so well educated, who offers a gentle, compassionate, child empowering approach to sleep training is one of the most amazing experiences there is. In my ongoing experience working with Joanna, implementing the hundreds of tips she has given us for baby #1 and Baby #2, I have seen first hand the improvements sleep can make in a child’s life. Joanna gave us so much guidance that I would have never thought of on my own, and I am so thankful for her. -Kate T. Nashville TN, Child was 20 months old at time of guilt-free, gentle sleep coaching. Read everything and still confused? This mom got the answers. Have you read every book and every article and "tried everything" and your child still does not sleep through the night? This mom had the same experience, but instead of continuing the struggle, she asked for help and now her child is a magnificent sleeper. Here is her honest and detailed success story here. - Erin B. Houston, TX. Here child was 6 months old at time of Guilt-Free, Gentle Sleep Coaching sleep coaching. A savvy nutritionist suffered in silence until she realized she did not need to "do this alone" and she asked for help. This mom says..."We Got Our Life Back"!! Its a Double Celebration! Successful sleep coaching for their child at 8 months and later after a un-expected 2 year old sleep regression. "This wonderful family came to me when their son was 8 months old and literally would NOT SLEEP unless someone was holding him. They were exhausted and frustrated and knew they needed expert help. In a short period of time, we reached all their sleep goals and they felt supported and comfortable through-out the whole process. When their son had a 2 year old sleep regression, they did not hesitate to get help again and within 3 days we were back on track. Now with their 2nd child on the way, they know Blissful Baby Sleep Coaching is a place to reach out to for help, hope and quick results for a successful family sleep transformation. As this mom says.... "SLEEP IS INCREDIBLY IMPORTANT AND YOU DON'T REALIZE HOW MUCH YOU MISS SLEEP, UNTIL YOU FINALLY GET IT BACK AGAIN! CALL JOANNA!!!" Co-Sleeping, Nursing Mom is thrilled with her Guilt-Free, Gentle Sleep Coaching Process. This mom loved her co-sleeping and nursing-on-demand experience until her daughter was 18 months. Then things got harder. She wanted to honor her attachment parenting philosophy while also helping her child learn the all important life skills of self-soothing to sleep. She found all her answers in a guilt-free, gentle sleep coaching process tailored to her child and her family's parenting values. K. Cody, TX, Child was 18 months at time of Guilt-free Gentle Sleep Coaching. Suffering From Your Child's 2 Year Old Sleep Regression? This Mom Got Help FAST! Here is a story of a mom that needed help fast. She and her husband run a successful business. They were stressed out and not getting any sleep due to a massive sleep regression by their 2 year old. She got all the tools, tips and tricks she needed to reverse the sleep regression gently and efficiently. She is now enjoying her energy, and focus and drama free evenings. She just had her 2nd baby is going to do some gentle sleep coaching soon so that her life does not get turned upside down again. Her story is compelling. Don’t struggle with sleepless nights! 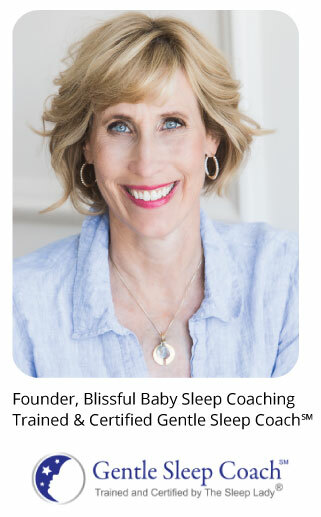 A well-rested & energized entrepreneur tells her story about her Gentle Sleep Coaching success with Blissful Baby Sleep Coaching. Penelope Jane Smith is founder of Real Prosperity inc. She is a well-known marketing expert and author who now loves her parenting life even more since now her darling 11 month old her baby boy sleeps peacefully through the night! Sleep Matters for a life well-lived! Exhausted and Frazzled because your child is not Sleeping? Empowering success story from a pregnant mom enjoying calm bedtimes and solid sleep before expecting her 2nd baby. This video testimonial is a detailed account on the guilt-free, gentle sleep coaching journey from a working mother who was expecting her 2nd child. She was worried that her first child's sleep was not on track. The bedtime struggles and lack of sleep was starting to affect the whole family and especially her own energy levels. This mom needed her sleep to have a healthy pregnancy and keep up with the demands of her profession. Now here whole family is sleeping beautifully. Everyone feels grounded and well-rested and ready to welcome their 2nd child! A. Albert, Texas, Son was 18 months at the time of guilt-free, gentle sleep coaching! "To say we were exhausted is an understatement. Working with Joanna was a Game Changer". This mom tells her story of going from sleep-deprived to feeling confident and in-control so that she could successfully manage an unexpected relocation for her husbands work. This elementary math teacher teacher was utterly exhausted from 6 months of no sleep. Her husband traveled all the time and her darling girl needed to be held continuously for every sleep cycle. Simply put, this mom could not keep up with the demands of care-giving and working and caring for herself while her husband traveled. Because she was a math teacher, this mom loved my guilt free, gentle methodology while also combining it my "data-driven" signature process that offers lasting results for healthy sleep habits. - Wendy Lu, Northern California and Seattle, WA: Her child was 6 months old at time of guilt free, gentle sleep coaching. This top High-Tech Executive Father reached out for help. Together, we successfully sleep coached his 7 month old daughter. This high achieving, dual-income working family were utterly exhausted when their 2nd child was waking every 2 hrs at night. Their focus and productivity at work was was suffering and they had lost the "work-life balance" they so desperately wanted and needed for their home life. This dad reached out for help and he worked one-on-one with me to successfully sleep coach their daughter so now everyone in the household is sleeping well and everyone is finally well-rested. This couple had nightly battles with their 2 year old son, even in the co-sleeping environment. They were were so exhausted and frustrated. They knew they could not solve this on their own. Dad was skeptical about coaching, but he knew things has to change. Mom really needed a break and she wanted her master bed back. Dad was really craving drama-free bedtimes and one-one-one time as a couple. Now, their son is now sleeping 11-12 hrs a night in his own room and the bedtime is easy and the nights and naps are peaceful. The good news is that now they are expecting their 2nd child and this happy news is proof of the ultimate success story of Gentle Sleep Coaching. - Tami and Daniel D. Lakeside, CA. Child was 2 years old at time of Guilt-Free, Gentle Sleep Coaching. This mom loved nursing and co-sleeping until the relentless wake-ups created an unsustainable sleep arrangement. "Baby was co-sleeping her first months and I loved it—the closeness was so sweet and we were able to sleepily nurse with little trouble. It felt like heaven to be near her and feed her through the night. We had planned for this to be a short term arrangement though, we knew we would want our marital bed back and for her to be more independent. When we started working together our baby was going to bed with me at 10pm with wake ups every 2-3 hours. Within a month she was sleeping 11 hours through the night in her own room. Making that happen process-wise was tailored just to us— Joanna created a plan with and guided us through it nightly. As new parents this was awesome, but also as husband and wife it was incredible because we were entirely on the same page and didn’t have any middle of the night squabbles, hurt feelings or miscommunication. We were a united team thanks to Joanna." Why aren't you asking for help? "The question is: why NOT hire Joanna as your sleep coach? When I see bleary-eyed parents confused as to get their child to sleep, I want to yell, “Hire Joanna!” Joanna gave me my much-needed sleep back through encouragement and education. I wanted what was best for my child, and the piece I was missing was understanding what kind of sleeper I had and how to give her what she needed, which was different from her two older siblings. Don’t waste another night without a light at the end of the tunnel." End confusion and self-doubt now! "While books may give you ideas, it took a wonderful consultant like Joanna to turn the ideas into practice steps, hold us accountable and encourage our learning through the exhaustion and tears (parents especially). I wholeheartedly recommend Joanna to families looking to bring peace back to their sleep routines so that your child can have more consistent sleep. Better nights lead to better days and better days lead to better nights." "Before we started working with Joanna, I had to lay down holding my little one all night, every night, with her still waking every few hours to nurse almost up to a year. I knew things had to change but I didn't know where to start. What a difference Joanna made for both Emilie’s sleep and our family dynamic! Our little one now sleeps through the night, and we couldn’t be happier with gentle sleep coaching." "If your baby is not sleeping through the night, call Joanna now! My 9-month-old son was still not sleeping through the night, and I was getting ready to start a new, demanding position at work. One night, in tears at 3 am, I told my husband I’d have to pass up this work opportunity because I knew I could not be who I needed to be at work and at home if the lack of sleep persisted. Without judgment, Joanna walked us through the concepts of Sleep Science, and completely explained WHY Kai was having such a difficult time. It only took us 3 nights to go from waking up 2 times a night, to solid sleep for 10+ hours. Several months later, everyone in the house is much happier, and I’m now 4 months into the dream job I’d have given up without Joanna’s help." "I like to think of Joanna as another member of of birth team. It made a huge difference to get support from our pediatrician, midwives, and lactation consultant after our baby was born, and likewise it made a significant impact to have a knowledgeable resource and support person to assist us with sleep health. Our baby has learned key skills and we are all getting the sleep we need, so our whole family is functioning at a higher level, in better health and better moods. We will definitely be coming back to work with her when our family expands again!" Sleep changes by age and stage. The testimonial statements are made by actual clients and represent reported results for the services offered. Blissful Baby Sleep Coaching does not offer medical advice. If you have any medical concerns you should consult your doctor immediately. Find your child’s age group below and read client success stories for children like yours.